Content can be added to your WordPress site primarily as posts or as pages. 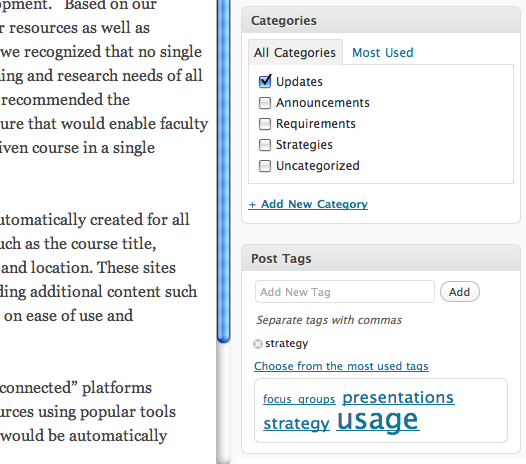 To decide which to use, see: Techniques > Pages vs Posts. By default, all new posts appear on the main home page of your site arranged with the most recent posts first (i.e. reverse chronological order) and are categorized as “uncategorized.” It’s a good idea to replace “uncategorized” with your own default category. Click the “+ Add New Category” link to do this. If you plan to use your site to blog and expect to have a lot of posts on various topics, consider adding additional categories. 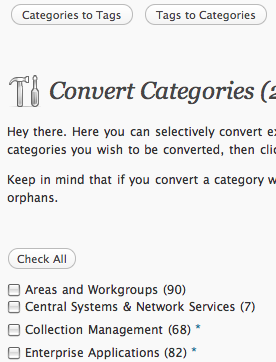 Use the “category” widget to display a list of the categories in your site’s sidebar. 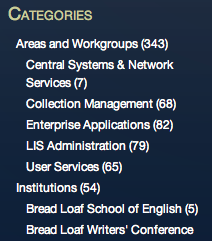 Categories can also be organized hierarchically. 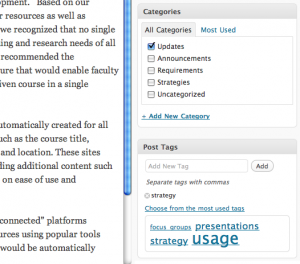 While any user who can contribute to your site can add one or more categories to their posts, only users who are editors can add new categories. 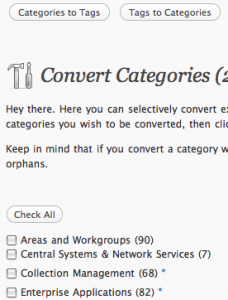 Lorelle on WordPress > Categories versus Tags – What’s the Difference and Which One?